Power Your Skincare | iiaa Ltd | The UK and Ireland distributor of Environ Skincare, jane iredale makeup and Advanced Nutrition Programme. There’s no doubt the buzz word on beauty experts lips over recent years is collagen. Whether you’re drinking it, popping pills of it, stimulating or creating it – there’s no denying the importance of preserving or increasing collagen levels as the answer to younger looking skin. 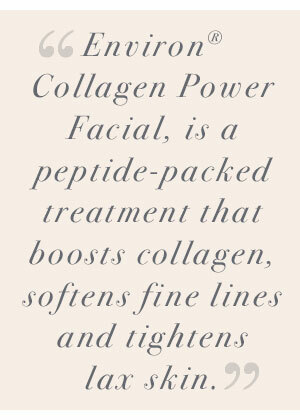 But what exactly is collagen and what treatments are you offering to ensure that you are providing the best methods to help build and protect your client’s natural anti-ageing superhero? Collagen is the most abundant protein in the body and is found mainly in the skin, muscles, bones, cartilage and all the body's connective tissues. In the skin, collagen is responsible for its strength and elasticity. Collagen is made by the fibroblast cells found in the dermis. In addition to making collagen, fibroblast cells are also responsible for elastin production, as well as natural moisturising factors such as Hyaluronic acid. Fibroblast cells protect collagen by inhibiting collagenase (an enzyme that breaks down collagen) and also make pro-collagenases which destroy old and damaged collagen. Normal, healthy collagen (in lattice-type formation) is incredibly strong. It can be compared to a rubber band as it is extremely elastic and springs back when stretched. There are several factors that contribute to collagen loss including; natural skin ageing and UV damage. Other key contributory factors to collagen loss include free radical damage and lifestyle (i.e. smoking, excess caffeine, alcohol and sugar consumption). If fibroblasts are damaged by UV rays or free radicals they will produce defective collagen. If deep, long term damage to the structural proteins occur then the skin loses its tone and structure. Therefore it is important to always advise clients to safeguard their natural collagen by ensuring they protect their skin from UV damage and follow a healthy diet and lifestyle. COLLAGEN – THE ELIXIR OF YOUTH? Without collagen the skin will lose its youthful, plumpness and slowly the signs of ageing becoming increasing visible. There's no stopping the ageing process. Luckily there are ways to slow it down and prevent some of the visible signs of ageing. One way to preserve youthful skin is to activate or regenerate fibroblast cells ensuring a good supply of collagen fibres and firmer skin. HOW TO POWER UP COLLAGEN? There has been plenty of buzz in recent years about the various ways to increase collagen levels. Nowadays there are more brands hitting the market from collagen pills, drinks, powders containing hydrolysed collagen (often derived from fish or bovine) claiming to combat wrinkles and fine lines. The global collagen market alone is anticipated to reach 6.63 billion USD by 20252. But what are the most effective treatments to help boost collagen?. Research has shown that vitamin C, as well as vitamin A are vital for collagen production. In a scientific study, researchers found that Vitamin C plays a critical role in the maintenance of a normal mature collagen network in humans by preventing the auto-inactivation of lysyl and prolyl hydroxylase, two key enzymes in collagen biosynthesis3. Vitamin C stimulates at least four genes related to collagen and specific elastin production. Putting together vitamin A & C are vital for normal, healthy production of collagen and elastin. The first protocol for therapists, who have clients looking for collagen products or who are concerned about lines & wrinkles is to address the issue from the inside out. Therapists should be advising their clients to include key nutrients, especially vitamin C and A,= in their diets to support collagen formation naturally. 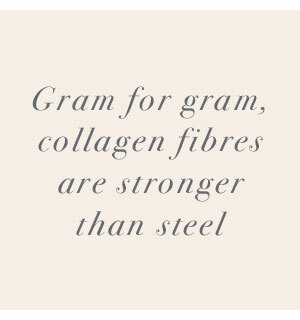 Both vitamins are regarded as essential building blocks for collagen, elastin and hyaluronic acid. Vitamin A influences up to a thousand of the body's genes and should always be recommended to clients. It is essential for the normal function of ALL skin cells. It induces the genes for collagen production - healthy lattice-type collagen I and III. Vitamin A also increases NMF (natural moisturising factors) in the skin, and improves the quality of elastin. 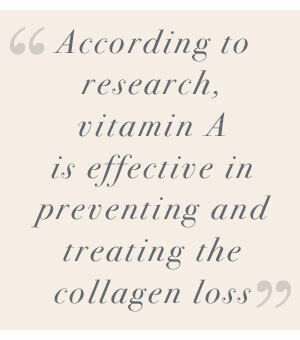 According to research, vitamin A is effective in preventing and treating the collagen loss caused by photo damage. It found that treating the skin with vitamin A, prevents the loss of type 1 and type 2 collagen caused by UV exposure4. Furthermore, the role of peptides, cannot be ignored. Peptides are made up of amino acids, which can help form collagen, elastin and GAGS (moisturising factors). Introducing clients to a moisturiser that contains a powerful combination of Matrixyl® 3000, Trylagen® and Matrixyl® Synthe 6® peptide complexes, can help to smooth out lines and wrinkles and restore collagen levels, making the skin appear plumper and smoother. There are various in-salon treatments that therapists can offer their clients to increase collagen levels naturally. Environ® Collagen Power Facial, is a peptide-packed treatment that boosts collagen, softens fine lines and tightens lax skin. Gentle sound waves and pulsed iontophoresis are used to drive a special nutrient-packed serum deep into the skin to give a plumper, more radiant appearance. The most effective treatment salons can offer is Collagen Stimulation Therapy™, which harnesses the body’s natural powers of healing to smooth the skin and achieve incredible results, pioneered by Environ® Founder Dr Des Fernandes. Collagen Stimulation Therapy™ (CST) can stimulate collagen production and tighten skin. It combines micro-needling with topical vitamin skincare and involves thousands of tiny needle pricks to the skin. The resultant bleeding initiates the release of platelets which in turn release a cascade of growth factors. This is what stimulates the production of collagen and elastin, resulting in a tighter, smoother and younger looking skin. One of the key growth factors released (TGF B3) is normally only found in foetal tissue and is responsible for initiating scar-less healing and regenerating skin. With the advent of new at home technologies, clients concerned with ageing skin can now support their in salon treatments further, to ensure better longer lasting results. The recently launched, Environ® Electro-Sonic DF Mobile Skincare Device can help clients maximise their results with at home use, especially for those concerned with fine lines and wrinkles. It helps to stimulate the skin and creates cavitations in the cell wall through low frequency sonophoresis and pulsed iontophoresis. This combined with a serum designed to target fine lines, can help deliver more essentials nutrients to skin. With the mounting amount of information on collagen on the market, it is easy for clients to feel overwhelmed as to which method to choose from when looking for collagen products or treatments for anti-ageing concerns. Encouraging clients to stimulate collagen naturally by providing the skin with the vitamins it needs to build collagen on its own or stimulating collagen through advanced salon treatments will give clients long lasting optimum results. 1 Dartmouth Undergraduate Journals of Science 2Grand Review Research – May 2017 3 Effect of vitamin C and its derivatives on collagen synthesis and cross-linking by normal human fibroblasts. Boyera N1, Galey I, Bernard BA. ; Int J Cosmet Sci. 1998 Jun;20(3) 4 Molecular basis of sun-induced premature skin ageing and retinoid antagonism. Fisher GJ et al.